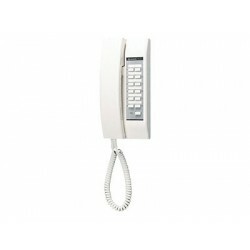 The TD-H Series is a multi-channel selective-call handset intercom system. With five different call handsets, the system can be configured to meet most any selective calling application. Aiphone TD-12H/BThe TD-12H/B is a multi-channel selective call intercom which supports a maximum of ..
TD-24H/BThe TD-24H/B is a multi-channel selective call intercom which supports a maximum of 25 stati..
TD-3H/BThe TD-3H/B is a multi-channel selective call intercom which supports a maximum of 4 stations..
TD-1H/BThe TD-1H/B is a single channel sub master.AIPHONE Authorized Master Dealer Jakarta - I..